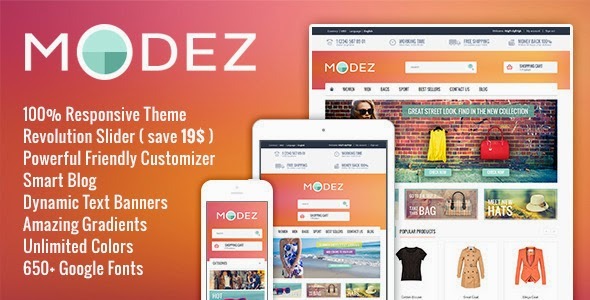 MODEZ is an premium Responsive Prestashop 1.6 Theme with Blog and Customizer Module. It is fully responsive and looks great on any devices. Modez is colorful, modern and dynamic theme. It contains everything you need for a successful e-commerce. Modez contains most powerful and popular slider ever – Revolution Slider ( save 19$ ), Smart Blog module and powerful Customizer module. Modez was created with HTML5 and CSS3. It contains good looking CSS3 animations. You can change everything you see. Unlimited colors, blurred backgrounds and gradients. PSD templates for every icon and banner. Theme with modern design and unlimited variations. It good as fashion shop, technology shop, household appliances shop, devices shop, games shop or any other categories. Easy install with great documentation. Unlimited Colors: 12 gradients, 60 textures and unlimited colors in colorpickers. Home Products Carousels: Featured products, best sellers and new products JQuery carousels. Facebook Float Block: Cute Facebook block floating left or right side of your shop. Brand Logo Carousel: Display manufactures / brands logos in slider on home page. Dynamic Text Banners: Easy add title, description and links to homepage banners. Smart Blog Module: Show your latest posts on homepage, or category page with many features. Fully Customizable: Powerful and user friendly customizer module allow to changes design. Additional Features: Social login and other great additional features for usability. Responsive Design: Fully responsive theme, looks good on any devices. Revolution Slider: Most powerful slider ever included in theme and save for you $19. Item Reviewed: MODEZ Responsive Prestashop 1.6 Theme + Blog 9 out of 10 based on 10 ratings. 9 user reviews.